Bosnia Herzegovina (henceforth BiH), as the other countries in the Western Balkans, is currently undergoing a transition towards the social inclusion framework adopted in the European Union. In this framework, a comprehensive profile of social exclusion is based on a multidimensional assessment of risk of poverty, attachment to the labour market and material deprivation measures. This chapter takes advantage of specially collected data on social inclusion using the module developed for the 2011 Extended Household Budget Survey (henceforth EHBS) following the recommendations of the Expert Panel described in Carletto et al. 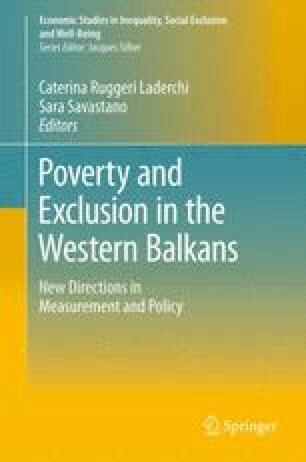 (Measuring poverty in the Western Balkans: Recent trends and new challenges. In: Ruggeri Laderchi C, Savastano S (eds) Economic studies in inequality, social exclusion and well-being. Springer, New York, 2012). The HBS 2011, when it becomes available, will allow for an in-depth profile of social inclusion in Bosnia and Herzegovina. This chapter offers a “preview” of the types of insights that a shift to new diagnostic indicators will lead to in terms of the profile of poverty and social exclusion in the country, as well as a more in-depth look at the material deprivation indicators collected for BiH and at the congruence of the diagnostic obtained with the exclusion indicators vis-à-vis a consumption-based one. The findings, interpretations and conclusions expressed in this chapter are those of the authors and do not necessarily reflect the views of the International Bank for Reconstruction and Development/The World Bank and its affiliated organizations, or those of the Executive Directors of The World Bank or the governments they represent. The World Bank does not guarantee the accuracy of the data included in this work. 1 The World Bank typically measures poverty in BiH, as in all other countries of Eastern Europe, based on an absolute consumption poverty measure.